Wedding preparation process is maybe the most anxious era in a couple’s life. Nerves become really tense in this process and this makes it easier to make mistakes. In this article, we will try to explain what mistakes do the couples most. Be careful, don’t do these mistakes! In wedding preparation process, couples usually experience very stressful days because of lots of things to do and pressure of families. Actually, not only during wedding but also in whole life new beginnings can be a stress source. The important thing is how to react in these kinds of situations and to avoid stressful thinking. The best advice we can give you during wedding preparation process is to plan each step and make a to do list with determining your needs. Now we will explain 7 deadly mistakes which is done by lots of people during wedding preparation process. If we ask you ‘what makes a wedding wedding?’’ what would you say? We can hear your words ‘bride and groom’. That’s right! But this answer is not enough. Of course wedding guests are as important as the bride and groom. Moreover, it would be meaningless to organize a wedding without guests, right? To carry out the wedding preparations according to your plans without any trouble, you should determine the number of your guests from the beginning. Because topics like your wedding budget, wedding venue, sitting plan during wedding are always connected with your guests’ number. We all should be honest, wedding preparation process usually run by bride candidates. 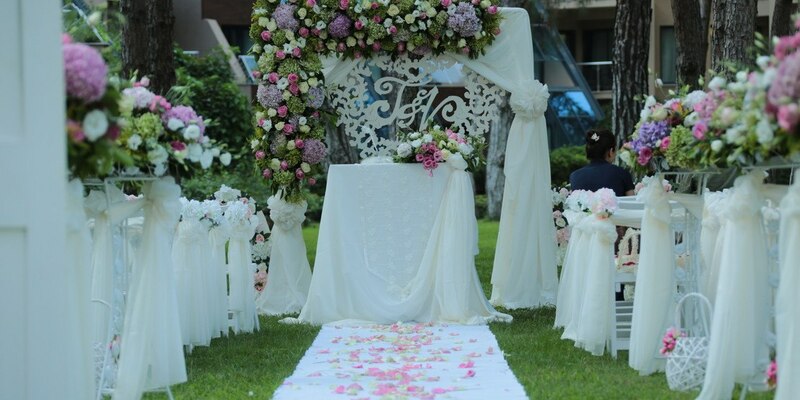 We are sure that you also will interest in all details such as wedding dress, venue decoration and even groom’s suite. Our advice is try not to act like you have 4 arms and 8 legs. Because you can not do everything on your own. You should include also your partner in this process and you should make all decisions together because it will be you and your partner’s wedding. Moreover, you should leave some works to the professionals and let them take the control. International wedding operator wedding city Antalya will give you all the support you need. You must have a huge shopping list as you are building a home together from the beginning. However postponing shopping or leave it to the last minutes can make you feel more stressed. Instead, you should act one by one with a good planning and timing. Our advice for you is to create a shopping list starting with bridal dress and suit. You can also ask for a help from your experienced friends or relatives. You can start to buy some things which are important for your home on the day you have decided to get married. It is better to purchase 8-9 months before the wedding services regarding the wedding day like wedding venue, decoration, wedding cake, invitation card, photo and video shooting. You should not forget to buy wedding accessories also. We are sure there are some wedding dress models which you are dreaming of and want to wear on your wedding day. But it is so important if these models fit your body type or not. Otherwise we are sorry but you wont be the bride in your dreams. For example you may choose a simple straight wedding dress if you have an athletic body, or if your body type is hourglass shape, than you may prefer to have fish model wedding dress. Do not forget, you should feature your good sides and hide your faults with your wedding dress. The most right thing that a couple can do after deciding to get married is to determine an estimated budget and make a plan for wedding and for designing a home accordingly. If there will be even a small shift from your budget can make you feel uncomfortable and increase your stress level. This is the reason why you should make your wedding shopping proper to your determined budget. A wedding’s must have is without a doubt music. You, your partner and of course your wedding guests will get emotional with your magical first dance song, have romantic time with slow dance music and enjoy wedding dance music. However for some reason wedding music always take second place and seem unimportant during preparations and few days before wedding, wedding songs are tried to be chosen. You should know that it is not that easy to prepare a list which will satisfy you because the songs you like probably wont occur on your mind immediately. Our advice is start making your wedding songs list at latest one month before your wedding. This should be the last thing on earth you should experience because even if you do your best during wedding preparation process, there will be still some things that are bothering you anyways. If you become stressed and demoralized immediately, you can not enjoy the process and you can not realize the good things happening. Do not forget that if you become upset, starting with your partner you will upset everyone around you. Wedding preparation process is a process which you will never experience again, excited and enjoyable even if it makes the wedding couple stressed. Please consider this: you are going to start a new life with the one you love. What else can be more beautiful than this? If you feel tense before your wedding you may contact with a beauty salon for massage, spa and body and skin care and you may decrease your stress level. You may be sure that your partner will realize your difference and your happiness will be your partner’s happiness.